Oprah Winfrey, award-winning daytime talk show host, is one of history’s greatest entrepreneurs and leaders. A journalist, an actress, a producer, an entrepreneur and a philanthropist, Oprah is one of the most prominent figures in America. Oprah, one of the most successful people in the nation, is a great example for all leaders of all industries. Oprah is hard-working and has persevered. A daughter to two working class parents, Oprah was not born into wealth. Growing up, she was raised by her grandmother, mother, and her father (all separately). Her grandmother taught her how to read before she went to school, allowing her to able to read and recite the Bible by the age of 3. But, Oprah did not always live in a safe environment while growing up. When she was young, she was molested and raped by different men; this caused her to lash out and rebel against her mother, almost landing her in a juvenile detention center. Her behavior eventually led her to return to her father. Under her father’s guidance and support, she became an honor student and earned prizes in dramatic recitation and oratory. As Oprah grew older, she continued to earn awards, receiving a full scholarship to Tennessee State University. When she began her career in broadcasting, she rose quickly, eventually getting her own show, AM Chicago (which was later renamed The Oprah Show), which had been struggling in recent years. Oprah quickly turned the show around, causing it to transform from a failing 30 minute segment shown in Chicago to a national sensation. Her work led her to be named the youngest “Broadcaster of the Year” in 1988. Oprah continued to dominate the daytime talk shows for the next 23 years. In addition to her charismatic persona, she also has a good head for business today. She continues to increase her portfolio through many different outlets. She is paid by the spin­off shows that she helped to create (e.g. Rachael Ray and Dr. Oz), and after brokering a deal with the Discovery Health Channel to create OWN (Oprah Winfrey Network), it been become more and more successful each year. Oprah even became the first female African American billionaire… because of her hard work and her refusal to give up, she went from nearly being sent to juvenile detention to becoming a leading American icon. Oprah is well-­rounded. Not only did she have her own award-­winning talk show, she is also an accomplished actress, appearing in The Color Purple, The Butler, Selma, and other films. While she is not afraid to take on a role, she has also worked behind the scenes, producing Selma, The Hundred­ Foot Journey, and others. She’s also worked on the opposite end of the media, in the realm of publications. Her own magazine, called The O Magazine, has been very successful. Oprah’s Book Club, started on her talk show, influences bestseller lists everywhere. Additionally, she has contributed to and started many different charities over the years, including establishing the Oprah Winfrey Leadership Academy for Girls in South Africa. Oprah is not afraid to get behind a myriad of projects at once, and she always makes sure each one is a success. Oprah is active in her community… she has lent her voice to efforts challenging racism in America. In one episode of The Oprah Winfrey Show, she conducted a racial experiment, separating the audience based on eye color and having the brown ­eyed group being treated much better than the blue­ eyed group. Oprah has also contributed to politics. Her support of Barack Obama’s 2008 presidential campaign was key to his success. Oprah has helped create legislation as well. In 1993, the “Oprah Bill” was signed by Bill Clinton. This bill created a national database of convicted child abusers. She has since continued her role in politics when, in 2008, she asked her audience to help the Combating Child Exploitation Act to be passed. Oprah is a visible leader. Although the show that she is most famous for, her talk show, is now off the air, she has not faded into the background. Her recent speech at the stamp dedication for Maya Angelou is just one of the many ways that she has remained visible and prominent. She is a public figure whose leadership is easily seen and her efforts felt by many. Oprah is honest. She has been very open about her struggle with her weight. She is thus very relatable and respected. Her successes and failures have been highly publicized – she’s has given multiple interviews about her attempts to lose weight and her triumphs and failures. In 1988, on her highest rated episode ever, she demonstrated how much weight she lost using animal fat as a visual. She has also been very open with the darker parts of her life. Oprah has shared much of her past with the world. When she was advocating for the “Oprah Bill” to be passed, she told the world how she had been abused as a child. Oprah’s transparency is clear in her openness with her personal life. 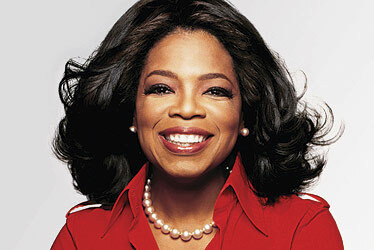 Oprah is an inspirational figure to many, as a great deal can be learned from her successes. The road to her vast wealth and influence has not been full of triumphs, her trials were just as essential a part in the making of her successful entrepreneurial career. She is the epitome of success because she never gives up, she always picks back up and is always trying something new, and giving her all to everything she puts her name on. She is active in her community and is a very visible leader. She is not afraid to try new things, always exploring new avenues of business. She has astute business acumen that has been developed through years of learning; she is sensible and she is honest. In Oprah, one can see many of the traits that all leaders strive to acquire. An integral trait of entrepreneurs is to never be complacent, as someone else is always working twice as hard as you are, and for more hours in the day. You can never stop trying to reach your potential, and when you do, you have to strive further, as Oprah has.